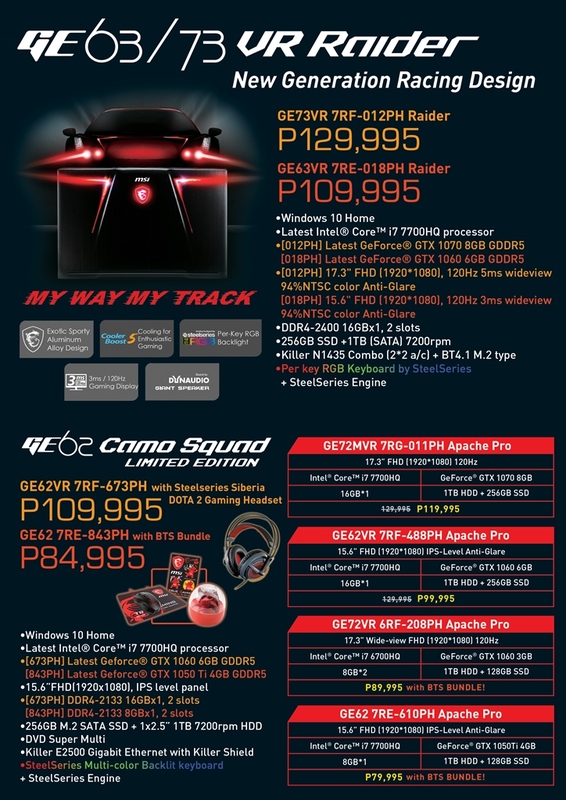 For over 30 years, MSI has been focused on pioneering and innovating gaming hardwares for worldwide enthusiasts to the overclocked gaming laptops, slimmest gaming laptops, Hi-Res Audio, 120Hz/3ms fast ganing display, and world’s 1st full size mechanical keyboard ganing laptop. All these milestones are the building blocks that solidified MSI’s position as market’s 1st in Gaming. The GE series has always been an all-time classic favored by gaming enthusiasts since its inception. But this year, the brand new GE63VR/73VR Raider has been given a new identity and weaponry inspired by exotic sports cars; with more angular appeals, looking like a true game changer to enthusiastic gaming. Through Per-Key illumination of the keyboard, you may receive real time game stats like ammo levels, health levels, tool durability, and take immediate actions, gaining full control of gameplays. Every hardware detail of this keyboard is also calculated and especially designed for professional gamers’ needs. The keyboard has ergonomically-designed keys with 1.9mm of key travel for better responsive and tactile feedback, optimum WASD zone and support of anti-ghosting capability for up to 45 keys. Mechanical-level shielding solution makes the gaming notebook keyboard the most solid ever. All these gaming features are all designed for gamers to gain full command over gaming missions. GE63VR – 018PH is the only gaming laptop with 120Hz refresh rate and 3ms response time panel, this is the go-to companion you can count on to never lose a detail during chaotic gameplays. The level of realism is drawn from the panel’s ability to produce up to 120 picture frames per second, topped with 94% NTSC Color Gamut calibration to bring you the most vibrant visuals for your ultimate entertainment pleasures. With its decent quality, the HDR format video will also show its stunning color range on it without any obstruction. For the first time ever, MSI is implementing Dynaudio’s Giant Speakers inside with 5x bigger full range chamber and 3x bigger speakers, that makes a gaming laptop to provide 50% more sound volume, quality enhancement that makes the exhilarating sound like never before. End-users can feel every engine sound waves roaring past with upgraded giant speakers and world-class Dynaudio sound system. Exclusive audio module design and independent resonance space for top-notch auditory sensation. Oversize 2 speakers + 2 woofers creating a realistic, fulfilling sound and immersive effects. It allows gamers to step into an incredible sound feast with highest satisfaction! The latest MSI Cooler Boost 5 excels as a dual thermal modules, adopting dual Whirlwind Blade fans with 7 heat pipes and well-endowed 4 airflows in the revolutionary cooling module. It ends up intensively and efficiently driving exhaust heat out of the system, raising the cooling technology to the highest level of its kind. Especially design for GTX 1070 level graphics with greater performance and lower temperature. MSI exclusive technology helps you find the USB port instantly, especially in the dark.